Abstract: The field of personalized medicine affords multiple opportunities to pharmacists, and pharmacists have specific knowledge, skills and abilities that make them uniquely suited to advance the use of personalized medicine as a clinical tool. The pharmacy profession as a whole, however, has been slow to embrace the concept of clinical pharmacogenetics and is now facing a critical juncture that can potentially redefine the professional identity of the pharmacist. Before practice transformation can occur, however, it is important for our profession to ask and fully explore the following question: Are pharmacists ready for the challenge of personalized medicine? When assessing the readiness of pharmacy for personalized medicine, one must consider factors that are specific to the individual pharmacist as well as systematic considerations that allow pharmacists to successfully integrate personalized medicine into their individual practice area. These include factors such as education and training, competency, an attitude of engagement and adequate support and guidance. Personnel, information technology and laboratory infrastructure are also critical elements that are required, and financially sustainable practice models must be developed. Successful advancement of clinical pharmacogenetics will also require the profession to clearly define their vision of what success looks like and where it wants to be at the end of the transformational journey. Without a clear destination, we will continue to move as individuals in different directions and fail to progress as a whole. While pharmacists might not be completely ready for the challenge of pharmacogenetics, they are most certainly up to facing the challenge. The time is right and the stage is set for pharmacy to embark on another transformative journey – a journey that will redefine the role of the pharmacist and will secure a place for pharmacy in the era of personalized medicine and beyond. While being extremely successful, the transformation of pharmacy practice challenged the profession and required pharmacists to confront and overcome several obstacles. Many practicing pharmacists felt unprepared to deliver clinical services and were uncomfortable in this new role. The profession responded with the creation and development of postgraduate education and training opportunities, including advanced practice residencies.1 There was also a major shift in pharmacy education in order to ensure that new pharmacy graduates were both competent and confident in the delivery of clinical pharmacy services. In 1992, the Accreditation Council on Pharmaceutical Education (ACPE) approved the Doctor of Pharmacy (Pharm D) degree as the only professional degree in pharmacy, eliminating the Bachelor of Science in Pharmacy degree. The ACPE also revised the standards for colleges and schools of pharmacy to “ensure that graduating pharmacy (Pharm D) students are ready to practice in teams and prepared to directly contribute to patient-centered care”.5 Times changed, practice evolved and the profession successfully adapted. Today pharmacy is facing a new challenge – personalized medicine. Fueled by advances in biomedical research and efforts such as President Obama’s Precision Medicine Initiative, personalized medicine is quickly gaining traction as a clinical tool to improve the prediction, prevention and treatment of disease.6 Pharmacogenetics, the use of genetic information to guide drug therapy decisions, is an important component of personalized medicine that presents a significant opportunity for the profession of pharmacy. Application of pharmacogenetics has been widely embraced in the hematology/oncology community, where most therapies use a genetically targeted approach. Adoption in other areas has been relatively slow due to the limited number of actionable gene–drug pairs that have been identified to date. However, clinical implementation of pharmacogenetics and personalized medicine continues to advance. Multiple academic medical centers have successfully integrated pharmacogenetics into their inpatient clinical services, and the number of institutions providing clinical pharmacogenetic services continues to increase.11 Pharmacogenetics is also expanding to the outpatient/ambulatory setting, and there are several examples of pharmacogenetic testing being successfully implemented in community pharmacies and large-chain drug stores.12,13 The pharmacy profession as a whole, however, has been slow to embrace the concept of clinical pharmacogenetics and is now at a critical juncture that has the potential to once again redefine the professional identity of the pharmacist. Before committing to another transformation in pharmacy practice, it is important for our profession to ask and fully explore the following question: Are pharmacists ready for the challenge of personalized medicine? Given that pharmacist-provided pharmacogenetic services will be delivered within the context of a health care delivery and payment system that poses significant challenges, we must also ask ourselves an equally important question: Is personalized medicine ready for pharmacists? The answers to these two simple, yet critically important questions will ultimately guide the how, when and why of clinical pharmacogenetics in pharmacy practice. The field of personalized medicine affords multiple opportunities to pharmacists, and pharmacists have specific knowledge, skills and abilities that make them uniquely suited to advance the use of personalized medicine as a clinical tool. Pharmacists are the only health care professionals who are specifically trained to understand and apply the fundamental sciences of pharmacokinetics, pharmacodynamics and clinical pharmacology to patient care. A core part of a pharmacist’s job is to individualize drug therapy based on a given patient’s age, size, organ function, concomitant treatments, diet, allergies and disease states. Pharmacists also provide dose individualization via therapeutic drug monitoring. One could, therefore, argue that pharmacists have been providing personalized medicine for quite some time and that genotype is just one additional source of variability that pharmacists should integrate when individualizing drug therapy for a given patient. However, personalized medicine and pharmacogenetics are still widely viewed as emerging areas of patient care, and the roles and responsibilities of pharmacists are still not clearly defined. Several professional pharmacy organizations, including the American Society of Health-System Pharmacists (ASHP),14 the American Pharmacists Association15 and the Pediatric Pharmacy Advocacy Group,16 have published statements supporting the involvement of pharmacists in pharmacogenetics and suggesting potential roles and responsibilities for pharmacists in this area. Most of the suggested responsibilities are focused around the clinical application of pharmacogenetics and include activities such as recommending pharmacogenetic testing, interpreting test results and designing patient-specific drug and dosage regimens. These are recommended as core responsibilities of all pharmacists, irrespective of training and experience in pharmacogenetics. There are also recommendations as to the roles that pharmacists with specialized education, training and/or experience in pharmacogenetics might play. Pharmacists are also encouraged to assume leadership roles in advancing the clinical application of pharmacogenetics as part of safe, effective and cost-effective medication practices. The opportunities for pharmacists in personalized medicine and pharmacogenetics are expansive. While being exciting, the breadth of opportunities for pharmacists in personalized medicine creates a unique challenge for a profession in transition. How can practicing pharmacists prepare for a role that is not clearly defined? And, how can we prepare future pharmacists for roles that currently do not exist? As a profession, there appears to be universal agreement that pharmacists should be involved in personalized medicine and pharmacogenetics. One of the greatest barriers toward advancing pharmacogenetics across the profession is the lack of clearly defined roles and responsibilities for which current and future pharmacists can prepare. What do pharmacists need to be ready for personalized medicine? When assessing the readiness of pharmacy for personalized medicine, one must consider factors that are specific to the individual pharmacist as well as systematic considerations that allow pharmacists to successfully integrate personalized medicine into their individual practice area. With respect to individual factors, education and training are perhaps the biggest considerations in determining practice readiness. The Accreditation Council for Pharmacy Education (ACPE) 2016 Standards include pharmacogenetics as a required element of the didactic Doctor of Pharmacy curriculum, and graduates of contemporary pharmacy programs are expected to be “practice-ready” with respect to integrating genetic information into patient-centered pharmaceutical care.18 However, few resources exist to support faculty in teaching clinical pharmacogenetics and there are a limited number of faculty who have completed formal training in this specialty area. Opportunities for experiential and/or practice-based training within Doctor of Pharmacy programs are also uncommon, with only a few programs offering the elective Advanced Pharmacy Practice Experiences in precision medicine and/or pharmacogenetics. Consequently, while new graduates will have the foundational knowledge needed to understand pharmacogenetics, their ability to confidently apply this knowledge to patient care remains questionable. While there is nearly universal agreement among practicing pharmacists, professional pharmacy organizations and accrediting bodies that pharmacogenetics is an integral part of pharmacy education and training, there is no clear consensus on what that training should include and whether different types of training are required for pharmacists practicing pharmacogenetics at different levels. The ASHP Statement on the Pharmacist’s Role in Clinical Pharmacogenomics suggests that “some advanced pharmacist functions applying clinical pharmacogenomics may require specialized education, training or experience”, but does not specifically outline what these advanced functions are.14 The statement also does not formally describe training requirements for advanced practice pharmacists in pharmacogenetics. Following the model of other advanced practice pharmacy specialties, however, it is most likely that postgraduate residencies and/or fellowships in pharmacogenetics will be required for individuals desiring to practice personalized medicine at a higher level. Opportunities for formal postgraduate training in pharmacogenetics remain limited, however, with only four programs (St Jude Children’s Research Hospital, the University of Florida College of Pharmacy, Children’s Minnesota and the University of Illinois at Chicago College of Pharmacy) offering postgraduate year 2 (PGY2) residencies in pharmacogenomics. Fellowship and formal graduate programs are available at the masters and doctoral levels, although these types of programs are typically research focused and reserved for individuals seeking careers in academia or industry. For practitioners, there are several professional development opportunities available beyond formal postgraduate training, including traditional continuing pharmacy education (CPE) programs offered live as part of the programming at national meetings or as stand-alone programs, many of which are self-paced and are available online. Examples of such programs include the Pharmacogenomics Education Program (PharmGenEd) offered by UC San Diego and the American Pharmacists Association training course developed collaboratively with Manchester University and RxGenomix. Certificate programs provide an alternative for practitioner education that allows more in-depth exposure to clinical pharmacogenomics than a traditional CPE program.21 Examples of such programs include the Test2Learn program developed by the National Association of Chain Drug Stores in collaboration with the University of Pittsburgh School of Pharmacy, the Pharmacogenomics Certificate Program offered by the University of Colorado School of Pharmacy, the Pharmacogenomics and Precision Medicine Certificate offered by Shenandoah University and the Pharmacogenomics Certificate Program offered as part of the annual Precision Medicine Conference at the University of Florida College of Pharmacy. Some hospital systems have also developed continuing education for their pharmacists. The Children’s Hospital of Wisconsin developed an online and live module course based on objectives from the National Coalition for Health Professional Education in Genetics guidelines.22 The online module includes introductory concepts on genetics and pharmacogenetics, particularly related to antiepileptic medications, and is a required competency for all pharmacists to provide pharmacogenetic services at the hospital.23 St Jude Children’s Research Hospital has also developed educational programs for their pharmacists to complete before providing pharmacogenetic consultation, serving as an example for other institutions to follow. Abbreviation: CPIC, Clinical Pharmacogenetics Implementation Consortium. Development of a consensus-based competency statement represents a significant step forward in preparing student pharmacists and practitioners for the clinical implementation of pharmacogenetics. It remains unclear, however, exactly how this competency statement should be integrated into pharmacy education and who will ultimately be responsible for updating, maintaining and overseeing these professional competencies. It is also important to recognize that simply defining the core knowledge required for proficiency in clinical pharmacogenetics does not achieve the ultimate goal of ensuring competence in the application of this knowledge in direct patient care. Exposure to core concepts through required didactic or CPE programs and successful completion of examination-based assessments do not automatically ensure clinical competency. Development of methods to assess and ensure practice readiness is, therefore, needed. In order to successfully advance clinical pharmacogenetics, the profession of pharmacy must first define what proficiency in each of the stated competencies looks like. Benchmarks can then be developed to assess proficiency, and a standardized process for assessment can be created. A clear vision of the roles and responsibilities for pharmacists is required, however, before this can be accomplished. Will it be enough for pharmacists to meet the minimum level of pharmacogenetics competency required to practice pharmacy assessed by the North American Pharmacy Licensure Examination?27 Or, will postgraduate residency training and/or certification through the Board of Pharmaceutical Specialties be required? Alternately, would a model similar to that used by the National Certification Board for Diabetes Educators be more appropriate where a minimum number of experiential hours providing clinical pharmacogenetic services is required in addition to passing a written examination and completing annual continuing education?28 These are the types of critical questions that must be answered before judgments about competency can be made. Completion of the Human Genome Project in 2003 led to many predictions that genetically guided drug therapy would rapidly become the standard of care. However, progress toward the clinical application of pharmacogenetics was much slower than projected and many, including pharmacists, began to doubt that pharmacogenetics would have any clinical value. Despite this negative outlook, the discipline of pharmacogenetics continues to build momentum and the energy for this forward movement has been created largely by pharmacists. In many institutions, pharmacists have played major leadership roles as clinicians at the patient interface and as thought leaders responsible for guiding the decision process with respect to which tests will be implemented as part of direct patient care. A high percentage of the CPIC guidelines also have pharmacists as the lead or senior author and the majority of participants in the pharmacogenetics interest group of the National Institutes of Health genomic medicine implementation network are pharmacists.29,30 This attitude of engagement is necessary for the continued advancement of pharmacogenetics as a clinical tool. Based on the results of several surveys conducted in pharmacists across a wide variety of practice settings, there appears to be a general consensus that pharmacists believe pharmacogenetics is relevant to their clinical practice.19,20 The level of interest in learning more about pharmacogenetics is also high.31 However, many pharmacists lack confidence in their abilities and do not feel prepared to apply pharmacogenetics in their practice setting due to a lack of knowledge and/or formal training in this area. This perceived knowledge deficit negatively impacts attitudes toward pharmacogenetic testing. This was recently demonstrated in a survey of over 700 pharmacists, in which the mean positive attitude score (calculated as the average score on eight survey questions) increased with the self-reported level of knowledge of pharmacogenetic testing. The most positive attitude scores were also observed in individuals who had received education about pharmacogenetics.31 This observation highlights the intricate interplay between education, confidence and attitudes required to advance clinical pharmacogenetics within the profession of pharmacy. Education will build confidence, confidence will shape and improve attitudes, and positive attitudes will foster engagement and provide the necessary momentum to move the discipline and profession forward. Professional organizations can help facilitate sharing of information and formation of supportive relationships through the development and dissemination of practice-based resources. Several professional organizations, including the American College of Clinical Pharmacy and the AACP, have SIGs within their membership, which are focused on pharmacogenetics. These SIGs provide an excellent opportunity for networking and create a platform for discussion and the exchange of ideas. Online resource centers, such as the one created by the ASHP, are also helpful tools for practitioners who are working through the implementation process. In addition, there are a growing number of online, practice-based resources that are freely available outside of professional pharmacy organizations. These include the Community Pharmacist Pharmacogenetics Network, which was established by pharmacists at Duke University, and the Genetics/Genomics Competency Center (G2C2), made available by a partnership between the National Human Genome Research Institute and several professional organizations. Pharmacists require a number of resources in order to implement clinical pharmacogenetic services, and personnel, information technology and laboratory infrastructure are critically important drivers of success.35 A strong interdisciplinary team that can help facilitate and manage the many components of clinical pharmacogenetics is an absolutely essential component of service implementation. At a minimum, the team should include a pharmacist with experience in pharmacogenetics and medication therapy management to lead the service, a physician-champion who can advocate for pharmacogenetic testing and a second pharmacist clinician to interpret test results and make recommendations.35 Laboratory personnel, institutional leaders, information technology specialists and genetic counselors are also important collaborators who should be involved with and supportive of the process. The information technology infrastructure at the institution must provide easy access to current pharmacogenetic information via the electronic health record, facilitate sharing of genetic data and be capable of integrating clinical decision support tools to facilitate genotype-guided recommendations. Given that the ability to generate large amounts of genetic information has become faster, easier and less expensive, information systems must also be able to manage and store large datasets generated by newer genotyping methods. Many practice sites currently do not have the technology infrastructure to support these core requirements. Pharmacists can turn this challenge into an opportunity, however, by taking the lead within their institutions to work with information technology personnel to create and develop the informatics infrastructure needed for successful implementation. Access to a laboratory that is accredited by the College of American Pathologists, licensed by Clinical Laboratory Improvement Amendments and able to perform genotyping for the variants of interest is essential. If the institution does not have a laboratory meeting these requirements on site, outside contract or academic laboratories can be used. This is most likely to be the case for services established in the ambulatory or community pharmacy settings. It is important to note that turnaround times for results may be longer with outside laboratories. Delays in receiving results may ultimately impact the usefulness of the information, particularly when needed to make urgent therapeutic decisions. Advances in genotyping technology have made point-of-care (POC) pharmacogenetic testing an option for practice sites in which many do not have ready access to a certified laboratory and there are several POC testing devices now available (eg, Spartan RX and the Nanosphere Verigene System) that can be used to test for specific genetic variants. Although not widely used at present, POC tests may offer a creative solution to the challenges created by limited laboratory access in the ambulatory and community settings. Financial resources are also required to sustain pharmacist-delivered clinical pharmacogenetic services. At present, lack of reimbursement for the tests themselves and for the services provided is one of the greatest barriers to widespread implementation. Insurance companies and/or patients can currently be billed for pharmacogenetic tests, but reimbursement is inconsistent and varies considerably. While panel-based tests are the most cost-efficient testing approach, the Centers for Medicaid and Medicare Services have provisions that prohibit reimbursement for panel-based tests, forcing pharmacist to use single-gene approaches that are less cost-effective. Even if reimbursement is provided for the test, the information gained is not valuable without pharmacist interpretation. Without provider status, however, pharmacists cannot bill for interpretation of genetic test results. This significantly limits the viability of pharmacist-delivered clinical pharmacogenetic services for the health care institution or business, given that patients with the resources to pay for these services out-of-pocket are currently the only drivers of revenue. In order to make the case for widespread application of clinical pharmacogenetics, there must first be evidence that genetic associations with drug dose, response or toxicity are predictable in the clinical setting. The strongest evidence to date supporting the predictive value of gene–drug associations is the CPIC guidelines.29 These evidence-based, peer-reviewed guidelines are intended to help clinicians translate pharmacogenetic test results into actionable clinical decisions. There must also be evidence that using genetic information to predict drug dose, response or toxicity improves patient outcomes. The number of studies that have prospectively evaluated clinical outcomes associated with pharmacogenetic testing is currently limited. However, data demonstrating that genetic testing improves treatment response and reduces hospital readmissions, emergency department visits and adverse drug reactions are quickly accumulating in specialty areas such as cardiology, oncology and psychiatry and in complex patients such as those treated with polypharmacy.41–44 With greater clinical application of pharmacogenetic testing, it is expected that this evidence will only continue to increase, provided that pharmacists and clinicians prospectively collect and document clinical outcomes. In addition to demonstrating clinical benefit, the cost-effectiveness of pharmacogenetic tests as a diagnostic tool must also be established and cost-related data for pharmacogenetic tests are accumulating. A recent study published in the Pharmacogenomics Journal demonstrated that one-time pharmacogenetic testing is cost-effective for preventing adverse drug reactions over a patient’s lifetime.45 Specifically, for a cohort of 40 year olds, pharmacogenetic testing resulted in an incremental cost-effectiveness ratio of US $43,165 per additional life year and US $53,680 per additional quality-adjusted life year, which is below the generally accepted threshold for cost-effectiveness (US $100,000 per quality-adjusted life year). Cost–utility analyses of tests have also demonstrated health improvements, albeit at a higher cost, as measured by quality-adjusted life year.46 It is important to recognize that cost-effectiveness is influenced by several factors such as test sensitivity and specificity and biomarker prevalence (eg, allele frequency). It is, therefore, difficult to compare cost-effectiveness across studies, given differences in study design and analysis. Despite this limitation, the majority of evidence to date indicates that pharmacogenetic test–guided treatment is cost-effective. The economic impact of pharmacist interventions within pharmacogenetics, however, remains unknown. Demonstration of a positive financial impact will ultimately be required to advance clinical pharmacogenetics within the profession of pharmacy. The greatest weakness impacting the readiness of pharmacists for the challenge of personalized medicine is the current lack of consensus and clarity regarding the precise roles and responsibilities of the pharmacist in this new practice area. What exactly does it mean to be “practice ready” and how will the profession ensure that current and future graduates meet this currently undefined standard? Continued advancement of clinical pharmacogenetics across the profession of pharmacy requires answers to these fundamental, yet critically important questions. It will also be important to address existing infrastructural barriers including information technology, reimbursement and multidisciplinary team development. Fortunately, opportunities for pharmacists in personalized medicine are great and many of the weaknesses that currently limit practice advancement are, in fact, unique opportunities for true practice innovation. Creation of new practice models in both the inpatient and community settings, while being challenging, is a unique opportunity afforded by personalized medicine. Development of the infrastructure required to successfully implement and deliver clinical pharmacogenetic services and application of novel genetic testing methods are just a few other unique opportunities afforded to pharmacists by personalized medicine. These opportunities are threatened by the limited time for pharmacists to perform clinical pharmacogenetics and lack of reimbursement for both genetic tests and pharmacist interpretation of information, and creative solutions will be required. The prospect of expanding roles and responsibilities is unsettling for many pharmacists. It is important to remember, however, that the profession of pharmacy has faced this challenge before and the profession did not merely adapt. Rather, it embraced and exceled at these new responsibilities. Pharmacists have once again been given the opportunity to redefine their professional identity and to apply their unique knowledge, expertise and skills in a different way to improve patient outcomes. Many pharmacists have embraced this opportunity and have invested significant time and energy into creating a solid framework for moving clinical pharmacogenetics forward. Academic and professional organizations have also responded by making important changes in the educational process and issuing position statements supporting the pharmacists’ role in personalized medicine. Pharmacists’ attitudes are positive and there is a high level of interest in learning about pharmacogenetics. The profession as a whole appears to be ready, willing and able to adapt and has therefore cleared one of the major hurdles to practice transformation. The path forward, however, has yet to be clearly defined. This is because the final destination of the transformational journey remains unknown. Will personalized medicine be a core responsibility required of all pharmacists or will it be a subspecialty of pharmacy practice that requires advanced education, training and certification? What does competency in pharmacogenetics look like and what are the benchmarks that will be used to measure it? Successful advancement of clinical pharmacogenetics requires clearly defining the profession’s vision of what success looks like and where it wants to be at the end of the transformational journey. Without a clear destination, we will continue to move as individuals in different directions and fail to progress as a whole. Setting a destination for the transformational journey must be a collaborative effort that includes representatives from academia, professional organizations, regulatory agencies and practitioners within and outside of the profession of pharmacy. Creation of a single, unified vision for how pharmacogenetics will fit into the profession of pharmacy will also require involvement of key stakeholders such as system administrators, health policy makers, information technology specialists, insurance companies and laboratory medicine. Inclusion of these stakeholders in the vision setting process not only builds important collaborative relationships but also incorporates perspectives on systematic issues that currently limit widespread implementation of clinical pharmacogenetics. Creation of a unified vision and definition of “success” in no way ensures that pharmacists are ready for personalized medicine and is, in fact, just the first step in charting a path forward. Clarity on the final destination, however, will allow the profession to look at where we are with a more focused lens and will allow us to truly determine whether current barriers, actual or perceived, are, in fact, barriers. It may also identify new challenges or hurdles that need to be cleared before practice can be advanced. Using genetic information to individualize drug therapy opens up exciting new opportunities for pharmacists to expand their clinical roles and responsibilities. As the only health care professionals specifically trained in the clinical application of pharmacokinetics and pharmacodynamics, pharmacists are uniquely suited to interpret and apply genetic information to the therapeutic decision-making process. This specialized expertise is recognized by physicians and other health care professionals who are supportive of the pharmacists’ role in clinical pharmacogenetics. There is also a general consensus among pharmacists that pharmacogenetics is important to their practice and interest in learning more about pharmacogenetics is high. However, the fundamental question remains: Are pharmacists ready for the challenge of pharmacogenetics? Admittedly, there are still several barriers to clinical implementation of pharmacogenetics that must be overcome. However, these barriers are more related to the challenges created by the system in which pharmacogenetic services are delivered, rather than with pharmacists themselves. Successful practice transformation requires opportunity, expertise and a spirit of engagement, and these elements are already in place with respect to pharmacogenetics. While pharmacists might not be completely ready for the challenge of pharmacogenetics, they are most certainly up to facing the challenge. Many times that is the most important driver of transformation and often the greatest hurdle to overcome. The time is right and the stage is set for pharmacy to embark on another transformative journey – a journey that will redefine the role of the pharmacist and will secure a place for pharmacy in the era of personalized medicine and beyond. Carter BL. Evolution of clinical pharmacy in the US and future directions for patient care. Drugs Aging. 2016;33(3):169–177. Didonato KL, May JR, Lindsey CC. Impact of wellness coaching and monitoring services provided in a community pharmacy. J Am Pharm Assoc. 2013;53(1):14–21. Hogue MD, Grabenstein JD, Foster SL, Rothholz MC. Pharmacist involvement with immunizations: a decade of professional advancement. J Am Pharm Assoc. 2006;46(2):168–182. Punekar Y, Lin SW, Thomas J 3rd. Progress of pharmacist collaborative practice: status of state laws and regulations and perceived impact of collaborative practice. J Am Pharm Assoc. 2003;43(4):503–510. Buttaro M. AACP house of delegates vote: colleges to move to sole entry-level Pharm.D. Am J Hosp Pharm. 1992;49(10):2346–2350. Initiative PM [webpage on the Internet]. Available from: obamawhitehouse.archives.gov/node/333101. Accessed March 29, 2018. PharmGKB [webpage on the Internet]. CPIC: Clinical Pharmacogenetics Implementation Consortium. Available from: www.pharmgkb.org/page/cpic. Accessed March 29, 2018. Food and Drug Administration 2018 [webpage on the Internet]. Available from: www.fda.gov/Drugs/ScienceResearch/ucm572698.htm. Pedersen CA, Schneider PJ, Scheckelhoff DJ. ASHP national survey of pharmacy practice in hospital settings: dispensing and administration--2014. Am J Health Syst Pharm. 2015;72(13):1119–1137. US Food and Drug Administration FDA authorizes, with special controls, direct-to-consumer test that reports three mutations in the BRCA breast cancer genes. Available from: www.fda.gov/News Events/Newsroom/PressAnnouncements/ucm599560.htm. Accessed March 29, 2018. Dunnenberger HM, Crews KR, Hoffman JM, et al. Preemptive clinical pharmacogenetics implementation: current programs in five US medical centers. Annu Rev Pharmacol Toxicol. 2015;55:89–106. Business Wire 2015 [webpage on the Internet]. Available from: https://www.businesswire.com/news/home/20151112005856/en/Rite-Aid-U.S.-Drugstore-Chain-Offer-Harmonyx. Accessed March 29, 2018. American Society of Health-System Pharmacists. ASHP statement on the pharmacist’s role in clinical pharmacogenomics. Am J Health Syst Pharm. 2015;72(7):579–581. Reiss SM; American Pharmacists Association. Integrating pharmacogenomics into pharmacy practice via medication therapy management. J Am Pharm Assoc. 2011;51(6):e64–e74. Kennedy MJ, Phan H, Benavides S, Potts A, Sorensen S. The role of the pediatric pharmacist in personalized medicine and clinical pharmacogenomics for children. J Pediatri Pharmacol Ther. 2011;16(2):118–122. Owusu-Obeng A, Weitzel KW, Hatton RC, et al. Emerging roles for pharmacists in clinical implementation of pharmacogenomics. Pharmacotherapy. 2014;34(10):1102–1112. Accreditation Standards and Key Elements for the Professional Program in Pharmacy Leading to the Doctor of Pharmacy Degree. Accreditation Council for Pharmacy Education. Standards 2016. Available from: https://www.acpe-accredit.org/pdf/Standards2016FINAL.pdf. Accessed March 29, 2018. Sansgiry SS, Kulkarni AS. The Human Genome Project: Assessing confidence in knowledge and training requirements for community pharmacists. Am J Pharm Educ. 2003;67(2):39. Mccullough KB, Formea CM, Berg KD, et al. Assessment of the pharmacogenomics educational needs of pharmacists. Am J Pharm Educ. 2011;75(3):51. Weitzel KW, Aquilante CL, Johnson S, Kisor DF, Empey PE. Educational strategies to enable expansion of pharmacogenomics-based care. Am J Health Syst Pharm. 2016;73(23):1986–1998. National Coalition for Health Professional Education in Genetics. Core Competencies in Genetics for All Health Professionals. 3rd ed; September 2007. Available from: http://www.nchpeg.org/index.php?option=com_content&view=article&id=94&Itemid=84. Accessed March 29, 2018. Zembles T. An inservice program on pharmacogenetics to individualize drug therapy. Am J Pharm Educ. 2010;74(1):10. Johnson JA, Bootman JL, Evans WE, et al. Pharmacogenomics: a scientific revolution in pharmaceutical sciences and pharmacy practice. Report of the 2001-2002 Academic Affairs committee. Am J Pharm Educ. 2002;66:12S–15. Ferro WG, Kuo GM, Jenkins JF, Rackover MA. Pharmacist education in the era of genomic medicine. J Am Pharm Assoc. 2012;52(5):e113–e121. Roederer MW, Kuo GM, Kisor DF, Kiros D, et al. 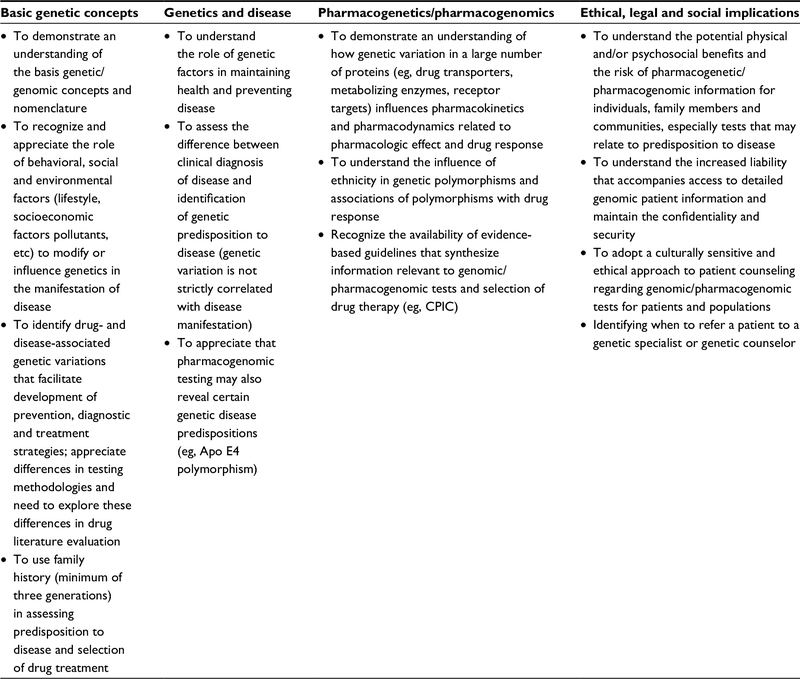 Pharmacogenomics competencies in pharmacy practice: A blueprint for change. J Am Pharm Assoc. 2017;57(1):120–125. National Association of Boards of Pharmacy [webpage on the Internet]. NAPLEX competency statements. nabp.pharmacy/programs/naplex/. Accessed March 29, 2018. National Certification Board for Diabetes Educators [homepage on the Internet]. Available from: www.ncbde.org. Accessed March 29, 2018. PharmGKBDosing guidelines - CPIC [webpage on the Internet]. Available from: https://www.pharmgkb.org/guidelines. Accessed March 29, 2018. Weitzel KW, Alexander M, Bernhardt BA, et al. The IGNITE network: a model for genomic medicine implementation and research. BMC Med Genomics. 2016;9(1):1. Roederer MW, van Riper M, Valgus J, Knafl G. Knowledge, attitudes and education of pharmacists regarding pharmacogenetic testing. Per Med. 2012;9(1):19–27. Weitzel KW, Elsey AR, Langaee TY, et al. Clinical pharmacogenomics implementation: approaches, successes and challenges. Am J Med Genet C Semin Med Genet. 2014;0(1):56–67. Crews KR, Cross SJ, Mccormick JN, et al. Development and implementation of a pharmacist-managed clinical pharmacogenetics service. Am J Health Syst Pharm 3011. 2011;68(2):143–150. Bright DR, Kisor DF, Smith A, Conaway M, Yu M. Implementation of a pharmacogenetic management service for postmyocardial infarction care in a community pharmacy. Per Med. 2015;12(4):319–325. Arwood MJ, Chumnumwat S, Cavallari LH, Nutescu EA, Duarte JD. Implementing pharmacogenomics at your institution: establishment and overcoming implementation challenges. Clin Transl Sci. 2016;9:233–245. Mills R, Haga SB. Clinical delivery of pharmacogenetic testing services: a proposed partnership between genetic counselors and pharmacists. Pharmacogenomics. 2013;14(8):957–968. Hartley LJ. Pharmacist education and cancer: attitudes and perceptions of clinicians surrounding a potential role for pharmacists in clinical pharmacogenomics. EC Pharm Sci. 2015;2.1:165–180. Williams MS. Genomic medicine implementation: learning by example. Am J Med Genet C Semin Med Genet. 2014;166C(1):8–14. Bright DR, Klepser ME, Murry L, Klepser DG. Pharmacist-provided pharmacogenetic point-of-care testing consultation service: a time and motion study. J Pharmacy Technol. 2018;34(4):139–143. Drug Topics. Pharmacogenetics in the community pharmacy. 2017. Available from: http://www.drugtopics.com/drug-topics/news/pharmacogenetics-community-pharmacy. Accessed March 29, 2018. Ramsey T, Griffin E, Griddin E, Liu Q, Brennan MD, Vaishnavi S. Use of pharmacogenetic testing in routine clinical practice improves outcomes for psychiatry patients. J Psychiatry. 2016;19(4):377. Bradley P, Shiekh M, Mehra V, et al. Improved efficacy with targeted pharmacogenetic-guided treatment of patients with depression and anxiety: a randomized clinical trial demonstrating clinical utility. J Psychiatr Res. 2018;96:100–107. Elliott LS, Henderson JC, Neradilek MB, et al. Clinical impact of pharmacogenetic profiling with a clinical decision support tool in polypharmacy home health patients: a prospective pilot randomized controlled trial. PLoS One. 2017;12(2):e0170905. Cavallari LH, Lee CR, Beitelshees AL, et al. Multisite investigation of outcomes with implementation of CYP2C19 genoytpe-guided antiplatelet therapy after percutaneous coronary intervention. JACC Cardiovasc Interv. 2018;11(2):181–191. Alagoz O, Durham D, Kasirajan K. Cost-effectiveness of one-time genetic testing to minimize lifetime adverse drug reactions. Pharmacogenomics J. 2016;16(2):129–136. Phillips KA, Ann Sakowski J, Trosman J, et al. The economic value of personalized medicine tests: what we know and what we need to know. Genet Med. 2014;16(3):251–257.